Enjoy hot toddies at home, in two flavors, with this easy-to-brew cocktail kit. Cinnamon. Honey. Piping hot water. A shot of whiskey. You know where this is going: the Hot Toddy. The drink we love to let warm us from the inside out originated in India, as a warm beverage made from fermented sap of the toddy palm. This version is more what you had in mind, and it comes with all the spices you need to brew the classic hot cocktail at home. Like the toddies that eventually made their way north through trade routes, the set includes cinnamon sticks and warming flavor combinations. 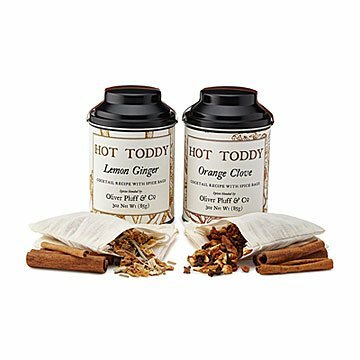 The Lemon Ginger blend soothes with lemongrass, ginger, and lemon peel, while the Orange Clove blend features its title flavors and a hint of rich, calming roasted chicory. Each canister also contains three reusable muslin jute tea bags, to make steeping easy. Just add boiling water, a tablespoon of your favorite honey, and 2 oz. of whiskey, rum, or brandy to create a boozy (and delicious) tonic, or skip the last step to enjoy a non-alcoholic treat. Made in South Carolina.